This review is of the DVD and double CD package. Rather than coming in a standard size DVD case like the single DVD option, this comes in a CD sized gatefold package that opens up to reveal the three discs plus nice photos. The package contains a DVD containing a "best of" collection of songs from Saxon's performances at Wacken in 2004, 2007 and 2009, and two CD's. 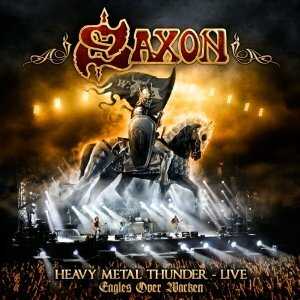 The CD's are a live recording from Saxon's show in Glasgow on 14th April 2011 - part of the band's Call to arms world tour. As you'd expect from the CD's, being a live show on the Call to arms tour the setlist contains some new material as well as crowd pleasing favourites. We get "Hammer of the gods", "Call to arms", "Back in '79" and "When doomsday comes" from the Call to Arms album, as well as all those classics that no Saxon show would be complete without, including "Wheels of steel", "Denim and leather", "Crusader" and many more. It's good that while there are some songs on the live CD that are also included on the Wacken DVD, there are plenty of songs that arent which adds a lot more variety and interest. The Glasgow show sounds to have been a good night judging by the album, but with professionals like Saxon, bad gigs are few and far between. One bit that I'm pleased about with the DVD is that as each song starts a title on screen tells you which years performance it is from - as that information isnt printed anywhere on the package then I'm pleased to see it is here. All three performances are well filmed and the sound quality is excellent. The DVD has been well edited to give a fairly seamless transition between songs so that although it's made up of footage from three shows it actually feels like one. This is a great DVD package. The DVD itself is excellent, and the includsion of a double live CD just makes it even better value. An essential addition to the collection of any Saxon fan.